Our Fair Deal http://ourfairdeal.org/ is crowdsourcing ideas for what we the people want to see in trade agreements like the Trans Pacific Partnership (TPP) currently being negotiated. Go to the Our Fair Deal to learn more or to participate, or to this OpenMedia site which has a convenient form to fill out. Trade treaty negotiations involve broad-based, open consultation with the public and all groups with an interest in participating. We should be hearing about what is happening from our elected representatives, not through leaks! This is completely in the spirit of what governments say that they want to do - it would fulfill the commitments made by many of our governments through the Open Government Partnership. Copyright should be fair, balanced, and reflect not only the desires of "copyright holders", but also the important and not entirely understood role that copying has always played in the development of human civilization. Human language, manners, and basic life skills are learned by copying. Storytelling, music, and arts aren't just about a few people making a living; they are about all of us building communities, expressing and fulfilling our potential. Artists have always copied from each other - the latest techniques, approaches, philosophies. New movements in art and music involve a lot of copying, and this is not inconsistent with artists making a living. Balance is also needed to provide an environment that can facilitate ongoing creativity and innovation, as excessively strong intellectual property rules favour a few owners of "intellectual property". This is a system that appears likely to lead to concentration of ownership in the hands of a few, as has been the trend with scholarly publishing in the last few decades. formally recognize at something like an international constitution that culture, community, and the public interest are important goals, not just economic benefits of intellectual property. For example, strong intellectual property laws designed to protect the profits of pharmaceutical companies at the expense of the health of those who cannot afford the medicines, are not good public policy. This does not mean that the interests of the industry are irrelevant, rather that we need to recognize that this not the only thing that is relevant - ultimately, the purpose of a pharmaceutical industry should be the health of the public, with economic sustainability of the industry a key but secondary sub-goal. added July 27: the penalties for copyright infractions should be proportionate to the infraction, and to other types of societal penalties. Downloading movies for personal viewing should at most be at about the level of hopping on a bus without paying. That's my vision. What's yours? Please participate! Thank you very much to the organizers of Our Fair Deal for providing a venue for this crowdsourcing. Kudos to the Directory of Open Access Journals for an oustanding second quarter! In the past few months, DOAJ has added 912 titles for a total of 9,759 journals. That's a net growth rate of over 10 titles per day, up from the previous rate of over 3 titles per day. 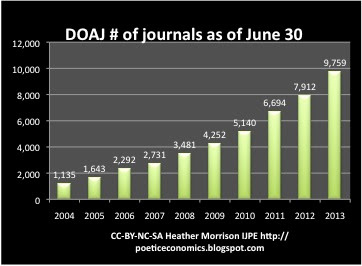 At this rate it won't be long before DOAJ exceeds the milestone of 10,000 journals. PubMedCentral growth continues to be very strong in spite of what looks like a bit of backsliding. The percentage of articles published with free fulltext available continues to grow at a steady pace and is now up to 25%. There are now 69 more journals are actively participating in PMC while there has been a drop of 102 journals providing immediate free access and of 16 journals making all articles open access. Highwire Free shows a similar pattern - overall strong growth - more than 60,000 free fulltext articles added this quarter for a total of 2.3 million and an increase of 2 completely free sites with a drop of 6 sites with free back issues. Overall the pattern for journals is very strong growth in full open access and cooperation with PMC, suggesting that the backsliders are a very small minority. Open access policy developments are also showing a strong increase this quarter, with proposed mandates up by 4 to 31 and sub-institutional mandates up by 3 to 39. 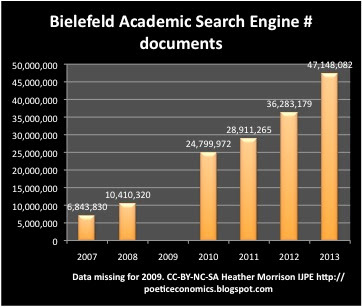 The growth rate of documents include in a search of the Bielefeld Academic Search Engine (BASE) - 3.6 million documents growth this quarter for a total of over 47 million documents - illustrates the ongoing robust growth of the repository movement. Although only a portion of these documents are peer-reviewed open access journal articles (many are theses, increasingly research datasets and historical digitized materials), if even a tiny portion of these numbers are peer-reviewed articles that would still be highly significant - 10% of 3.6 million documents would be 360,000 documents, for example. The Social Sciences Research Network alone added 14,403 fulltext papers, and arXiv more than 22,000 documents this quarter, supporting this evidence of strong growth in open access via repositories. 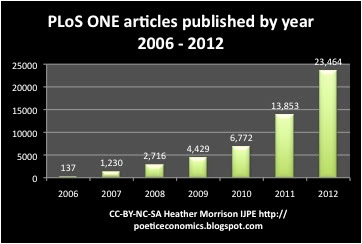 Megajournal PLoS ONE's amazing growth has not been slowed one little bit by the entrance of competition in this market - in 2012 PLoS ONE published over 23,000 articles, up from just under 14,000 in 2011! Finally, a special mention to the Internet Archive - while only a small fraction of the works posted there are scholarly in nature, the capture of over 66 billion webpages this quarter for a total of over 347 billion webpages is noteworthy.